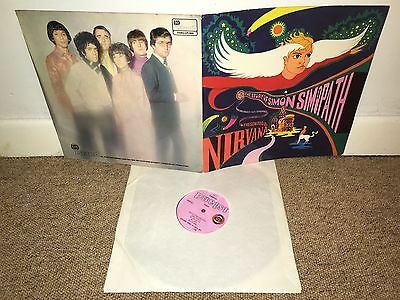 NIRVANA Story Of Simon Simopath LP 1967 UK 1st Press!!! Hi, and welcome to psych_out! auctions!!! I've collected50's, 60's, and early 70's records of almost every genre -Psych, Prog, Psychedelic Funk, Soul,Rhythm 'n' Blues, Pop, Folk, Garage, Acid, Freakbeat, Rock, Jazz e.t.c and everything in between for all my life!! !Obviously, 90% of the LP's I've ever gotten hold of are completelytrashed from the hard living ways and the rock 'n' roll, drug and booze fuelled debauchery of all the wild parties of the times, but the golden 10%? Reluctantly, I've decided tooffer themto all of you serious record collectors out there!!! I'm currently trying to set up a record label so unfortunately personal sacrifices have to be made when it comes to my collection, resulting in GREAT benefits for all you shrewd bidders and serious connosieurs of TRUE solid goldmusic history out there!! !Make no mistake, I'lltry my best to consistently offer some of theVERY BESTrecords available on ebay, many which have taken me YEARS to find!!! I aim to put a weekly batch up (time permitting) every Wednesday, all timed to end 10 days later on Saturday night. I'll only everofferTHE BEST, MOST AMAZING,MOST IMPORTANT,VERYRAREST UK 1ST PRESSORIGINAL RELEASE RECORDSI've got!!! I won't insult you with later 2ndpressings unless they are of exceptional quality and rarity. I'm sure you love good music as much as me, especially when it's a 1st Press LP,direct from the master tape, as the musicians intended it to be heard (none of this "digitally remastered",weak reissued,remixedrubbish from hired hands with one eye on the mixing desk and the other on the clock! If these sessionmen really knew how genius should sound, surely they would've been geniuses themselves?! There will only ever be one Hendrix, and that's just a tiny example). I try tobe one of the best sellers on ebay and would like to thank all of you potential bidders for your support and taste in music!!! I strictly grade all LP's I list, visually and sonicallyusing the UK RRPG standardsas customer satisfaction is highly important to me, and I'll always do my very best not to let you down. Be sure to add me to your favourite sellers list and check my auctions frequently as i'll be listing some gems that you just WON'T want to miss out on!!! I think that's everything, so let the auction commence!!! Label &year:OriginalIsland ILPS 9059 LP,UKStereo 1967 IMPOSSIBLY RARE 1st Press!!! One of the VERY RAREST psych LP's of all time!!! WITHOUT QUESTION, EASILY ONE OF THE VERY RAREST PSYCH LP'S OF ALL TIME!!! THISOUTRAGEOUSLY RARE CLASSICDEBUT LP SIMPLY NEVER TURNS UP IN IT’S EARLIEST EVER TEXTURED PINK EYE DAY OF RELEASE STEREO UK 1ST PRESS FORM (FAR, FAR RARER THAN THE MONO)!!! THIS SOLD NEXT TO ABSOLUTELY NOTHING!!! IMPOSSIBLE TO FIND, ESPECIALLY LIKE THIS!!! BARELY PLAYED WITH AWESOME AUDIO AND A STUNNING SLEEVE!!! UNBELIEVABLE!!! YOU WILL SURELY NEVER GET THE CHANCE AGAIN TO OWN SUCH AN OUTSTANDING EXAMPLE!! !Do not miss out on this priceless piece of psych history,bid now!!! About : Ultra RareOriginal 1967 UK 1st Press!!! ThisMASSIVELY RARELPinitially sold barely anything (LP's were also really expensive to most people back then!!!) and thereforehad a verysmall run, and isINCREDIBLY HARD TO FIND, especially in this condition!!! AN absoluteclassic LP from this incredible band!! !Anastonishing album that really DESERVES to be in EVERY serious60's / 70's record collection!!! Don't miss out on thisMEGA RARE LP!!! If you like good music, bid now!!! ClassicUK textured pink Island 1st Press labels!!! Both sidesareOUTSTANDING with NO real signs of age, NO graffiti, and NO writing ORtears whatsoever!!! Just has an absolutelyTINY amount of ultralight spindle marks which suggests that this has barely been played at all!!! IMPOSSIBLE for a49 year old record!!! Both must grade overall at least asExcellent++!!! Summary :An OUTSTANDING barely played exampleof this OUTRAGEOUSLY RARE psych classic original 1967 Island UK 1st Press LP!!! Hard to find in ANY condition, but SERIOUSLY RARE TO FIND ONE AS TRULY MAGNIFICENT AS THIS!!! YOU WILL NEVER GET THE CHANCE AGAIN, so don't miss out on this scarce opportunity to own a true piece of 60's/70's music history!!! Bid now!!! Please take a look at all my other auctionsformany other ultra rare classic LPs,and feel free tocontact me with any questions you may have. Thanks againfor looking, it's truly appreciated!! Cheers!!! I've realized that most countries have their own unique grading system. I base mine strictly on the UK RRPG grading system (occasionally with a + or a - to indicate the higher and lower ends of the grade, though I only use these if i'm having real trouble deciding! ), so please check their chart for further clarity if you are unsure of what my grades mean. As a general rule, a mint record will be 100% perfect, an excellent record will be in fantastic clean condition with the occasional mild mark and minor use fromthe years, and a very good record will have noticeable, yet light visual markings and obvious signs of age and use, but will still remain clean with relatively light wearand willplay fantastically wellwith plenty of life remaining in it. I very rarely offer records below the very good region unless they are of an EXCEPTIONAL rarity and playing quality...I hope this helps! Postage and packing (UK bidders)will be £4.49 for the firstitem, £3.00 for every item after that. International buyers, postage is £8.99 for the first item, £3.00 for every item after that.Contact is expected to be made within3 days, and payment usuallyexpected within 7 daysof the auction ending, otherwise you may lose priority over theitem and it maybe relisted e.t.c. UK bidders, I accept paypal orpostal orders. I will reluctantly accept cheques, although they will take at least a week to clear. That is why I prefer the other methods, as it means I can get your item to you faster.International bidders, I can only accept Paypal, IMO,or Bank Transfer!I only accept £s. Unfortunately, I cant accept any other internet payment other than paypal. Please just ask if you have any questions or if you require further information. The photos below are of the genuine item, apologies for the occasional blurryness orglare from the light in some of them. If you would like further pictures or details, please ask. If you are not happy with your item, please let me know within 3 days. I pride myself on my 100% feedback so if there are any problems, I will do my very best to sort them out. All my auctions start from abare minimum price,so there is always plenty of opportunity for a bargain! Please check my other auctionsformany moreof the rarest, most awesomeVinyl Record items ever!!! Thanks for your time, happy bidding!